The above pastel portrait of my 2nd Great Grandfather, James Pennington (1828-1903) hangs in the Cannonsburg Museum, Cannon Township, Michigan. The author of this article borrowed the portrait, had it professionally photographed, and reproduced full-size. It now hangs on my living room wall. James Pennington hadn’t been married but for 4 years when Lincoln called for troops to invade the South to preserve the Union. His wife was pregnant with their second child, his oldest was only 3. They lived in rural Courtland Township, Kent County, Michigan where he worked the fields as a farmer. His daughter was born in August of 1861. His 2nd son was born December of 1862. Men from his community were going off to war fighting with any of the numerous Michigan-based outfits but James held off until 1864. Lincoln again called for troops in August of 1864 and James Pennington heard the call. 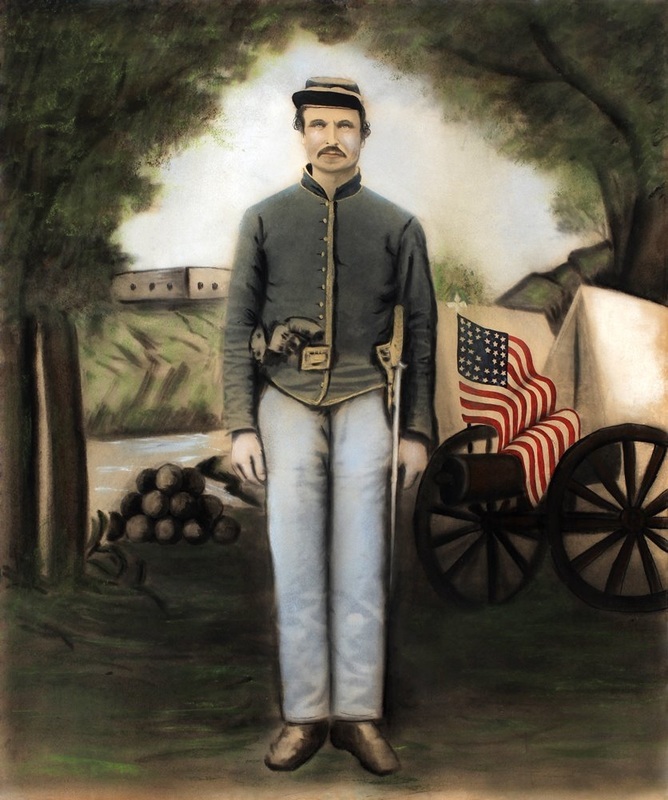 But rather than join any of the Michigan units he chose to travel over 400 miles to Genesee Falls in the state of New York where he joined the 9th New York Cavalry, co. G.
The winter of 1864 proved to be the coldest and harshest in severity of all the war and James suffered because of it. His limbs and joints were frozen, his body shivered, from exposure to the elements. As a new recruit, James was placed on picket duty in the deep woods near Winchester, Virginia when his headstrong colt stepped into a hole sending James forward on to the pummel of his saddle before hurling him to the ground. James’ friend and tentmate Private Rycroft rushed to his aid. James was white in the face and complained about the pain believing his kidney had been hurt. They made their way back to camp where James laid inside his tent in writhing pain. He sent his tentmate for medicine because he hurt too bad to go himself. It wasn’t his kidney that had been hurt. Rather it was his left testicle crushed by the blow to the saddle. This pain would cause him discomfort in passing water for the rest of his life. The crushed testicle was not his only sustained injury. He was also compensated for rheumatism in the joints from exposure to the elements and enlarged prostate. James Pennington was present for the Calvary battle at Waynesboro and at Tom’s Brook. How did I learn this privileged (and private) information about James’ brief stint in the Army? 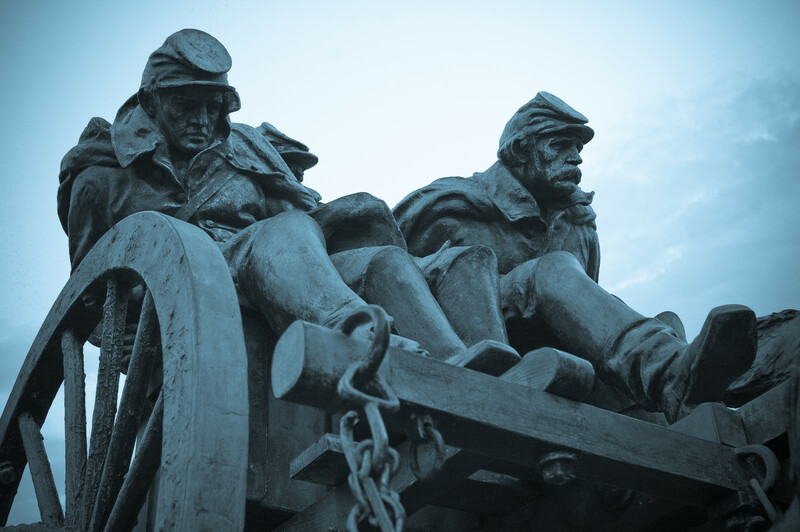 That is the scope of this series of articles where we will be taking a comprehensive look at the records available for your Civil War veteran. In this first article, we will review the CMSR (Compiled Military Service Record) to learn what it is, where it is located, and how to use it in your genealogical research. In my opinion, the CMSR is the reader’s digest version of your Civil War Soldier’s military service in Lincoln’s War, either with the Union or Confederacy. The records are held at the National Archives in Washington, DC. Not to worry, you won’t have to travel there to order your Soldier’s CMSR. What does the CMSR include? The CMSR will typically include: the name of your soldier, his unit(s) served, his occupation at time of enlistment, his birth place, his physical description, his rank when mustered in and mustered out, his muster rolls (present of absent) in 2-month intervals. It may also include any prisoner of war records (if applicable), enlistment papers, record of death (if died in service), any personal papers that might pertain to the soldier, and leaves of absence (furloughs). Note that I did say the CMSR is available whether Union or Confederate. The CMSR database has been indexed. This indexed version is available on Ancestry.com. Fold3.com is placing many CMSRs online as well. Let’s now examine the CMSR of James Pennington. The first document we find in James Pennington’s CMSR is his volunteer enlistment paper. 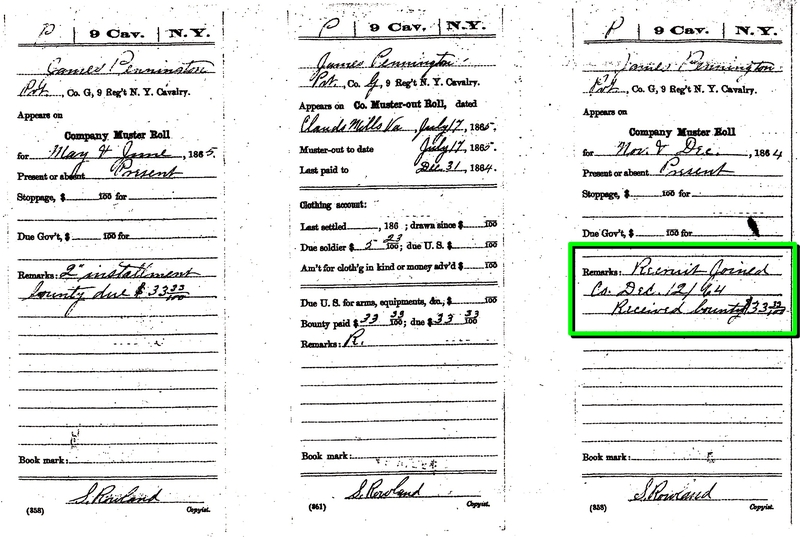 This paper shows that James was then allegedly 35 years of age, a farmer born in Scotland, and that he enlisted for a period of 1 year from the town of Lockport, New York on 4 October 1864. 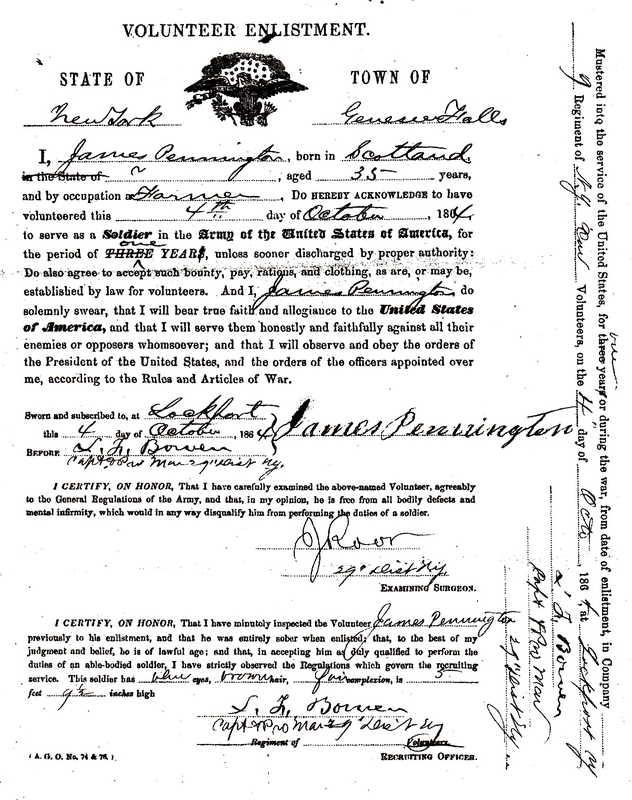 James Pennington signed the document. Below is given a physical description of James. He had blue eyes, brown hair, a fair complexion, and stood at 5 feet and 9 ½ inches high. For many people who do not have a photograph of their Civil War document, this physical information, though short on details, is worth having the CMSR. 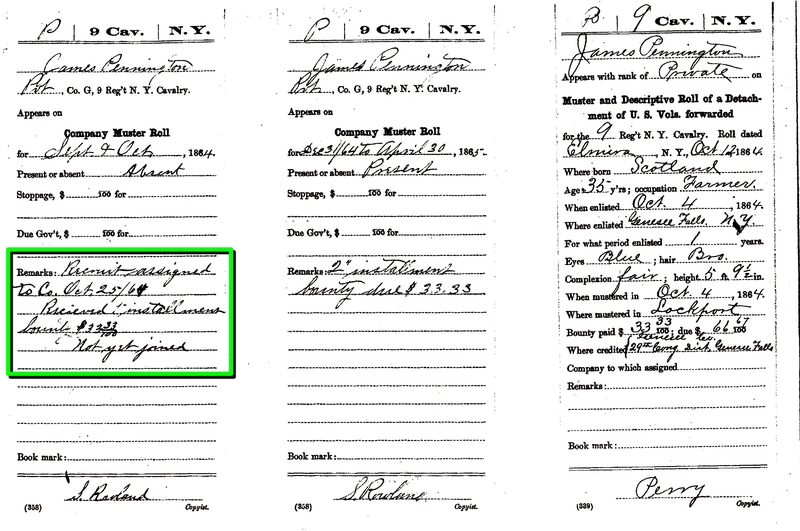 Apparently, James enlisted from Genesee Falls, New York but signed the papers at Lockport. The muster cards are equally as useful. According to James’ daughter Edith who was interviewed shortly before her death in the 1960s, her father was at the battle of Cedar Creek. Let’s see if this is possible according to the muster cards. The muster cards were kept every two months to keep track of every soldier: either marked absent or present. 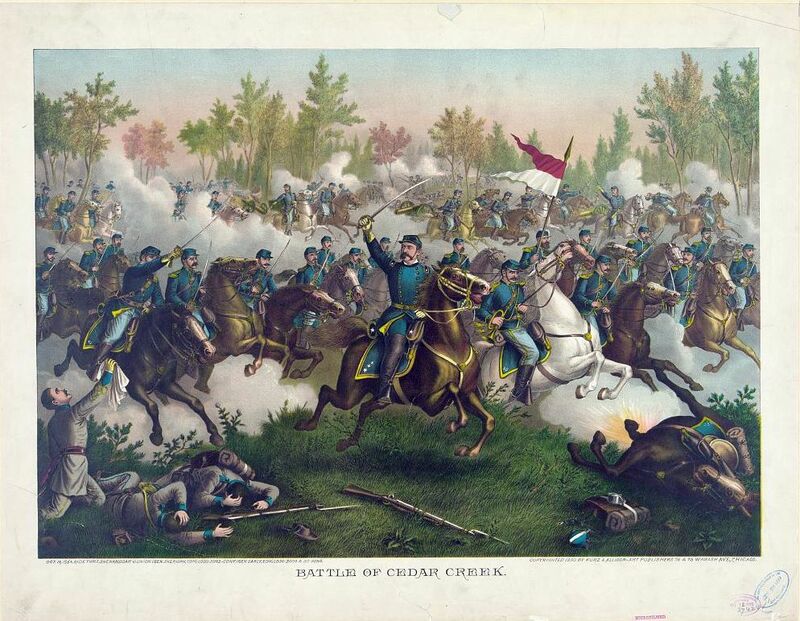 The Battle at Cedar Creek was fought on 19 October 1864 between the forces of Union Major General Philip Sheridan and Confederate Lt. General Jubal Early. As James enlisted on 4 October in New York he would have been shipped to Washington DC for training. It is unlikely he was present at the battle. The muster card dated September and October 1864 shows Pennington marked “absent”. Remarks state that he was assigned to the company on 25 October 1864 but had not yet joined. The following muster card for November and December 1864 states that Pennington was then present with remarks that he joined the company on 12 December 1864. These facts prove that James Pennington was not at Cedar Creek, at least not for the battle. Something to keep an eye out for in the CMSR file is the summary page found on the outside of the packet. There is a comment section found on this page entitled “Book Mark”. If you see a number written in this space it means that there is additional information available: information created post-war and added to the soldier’s file later. You will need to submit a separate request using this number to obtain these additional records. In the case of James Pennington there are no additional files. Browse to the National Archives site at Archives.gov. Select the blue menu entitled “Veterans’ Service Record”. 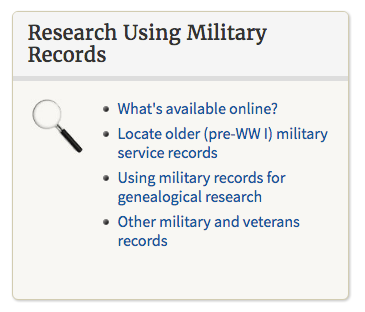 In the middle of the next page search for the section entitled “Research Using Military Records” and select “Locate older (pre-WW1) military service records. 4. 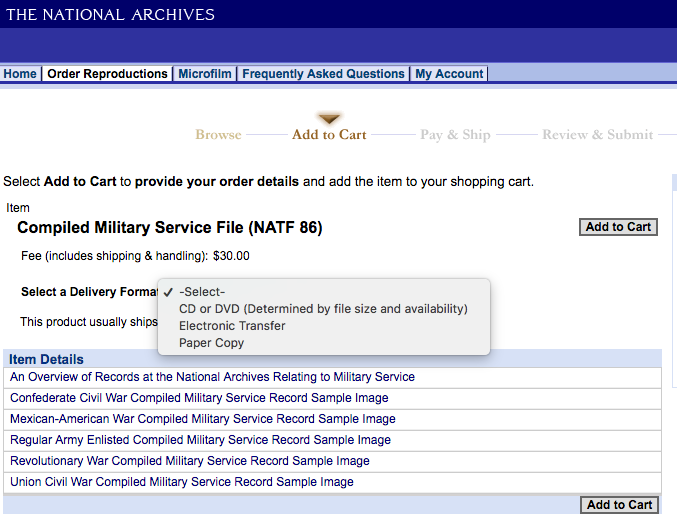 Then browse down on the next page to the section “How to Order Older Military Service or Pension Records” and either select “Order Online” or “Download Form”. If you choose to download the form you will be required to mail it in. Ordering online is much simpler and faster. The CSMR request form is Form Number NATF 86. The charge is $30. The site states that your order will be fulfilled (online) in 60-90 days. Let me know on this site what you find in Your Civil War Veteran’s Compiled Military Service Record.